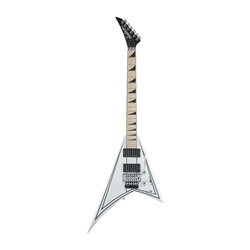 The Jackson X Series Rhoads models continue the metal legacy pioneered by the immortal Randy Rhoads. Regal and proud, the RRX24M offers fantastic tone, ultra-fast playability and unbelievable value for 21st century guitarists. Features a basswood body, one-piece through-body maple neck with graphite reinforcement and scarf joint, and a 12”-16” compound radius bound maple fingerboard with 24 jumbo frets. Decked out for today’s modern metaller, the RRX24M delivers searing tone from a pair of active Seymour Duncan® Blackout pickups that can be further shaped by two volume knobs, a master tone control and three-way blade switch. Also equipped with a recessed Floyd Rose® double-locking tremolo system for outstanding sustain and solid intonation. Infused with flashy looks, the RRX24M is available in Snow White with Black Pinstripes featuring reversed black sharkfin inlays and chrome hardware.